Do I think it’s funny to watch the human female do the trying-to-toe-off-the-rubber-boots-while-carrying-parcels-and-a-backpack dance? Did I chuckle a bit when all of the spaghetti squash growing in her compost heap died of powdery mildew and some other malady? Do I snicker at how the floor CONSTANTLY needs sweeping from all the damp dirt and leafy bits that keep getting tracked in? Am I gleeful at all the human plans that have been ruined due to incessant inclement weather? However, I want it on record that I am merely making the best of a bad situation, NOT claiming credit for the recent rains and flooding. …was not my doing. Sure, seeing all the washed-away cars piled up on the roadside was interesting, but people died. I wouldn’t do that. I need all the minions and thralls I can get. Two final pitfalls lie between us and the checkout–candy and flowers. I have managed to shepherd Sigyn past the marzipan and Toblerone, but I don’t think I’m going to be able to keep her out of the posies. Quite literally. Behold my Queen, enthroned among the peonies. My sweetie sure knows how to choose blossoms to complement her coloring. We have passed out of the produce section of the market and threaded our way through various tempting alcoholic drinkables, bins of spices and candies (the almond glazed pecans have Sigyn and the human female swooning), jellies, chips, cheeses, and frozen goodies. Now we are wandering through the seafood, meat, and charcuterie. 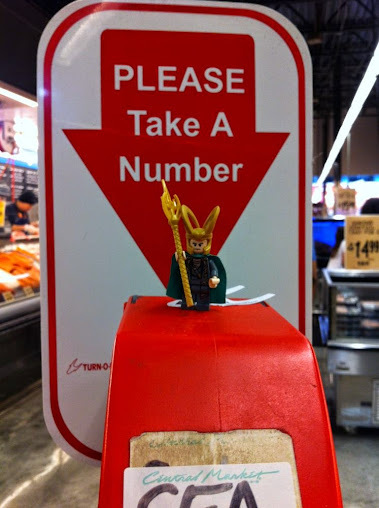 There’s a machine that instructs one to take a number. I refuse to do so–I should be number one wherever I go! You, fishmonger! Some of your finest oysters and salmon, forthwith! While he is wrapping those up, I will take a little rest. It’s a warm day, I’m full of dim sum and cheese samples, and I need to cool off. Luckily, there is a nice little Jotun-friendly spot right next to the squab. Uh oh. Danger! The bakery is dead ahead. I predict we lose the human female, her Knittery friend, and probably Sigyn somewhere in the Bermuda Triangle whose limits are defined by tres leches cake, fresh pão de queijo (Brazilian cheese breads), and the almond croissants. Oops. 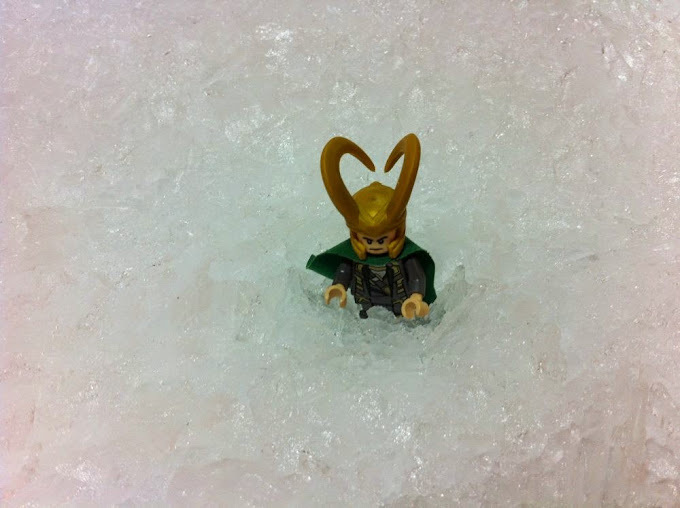 We’ve lost Sigyn already, in the kitchenwares department. Mischief in Houston, Part IV: People Really Eat These? The human female is quite disappointed that the apple display contains no varieties she has not yet tried. Apparently, ‘Lemonade’ and ‘Smitten’ are not fancy enough for her. Snob. 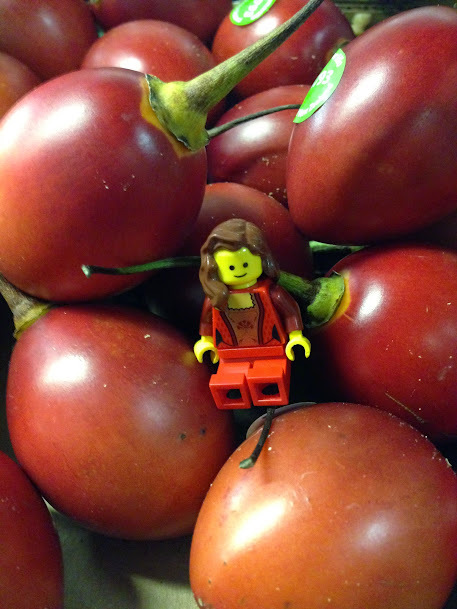 She and her friends have wandered into the Exotic and Bizarre section of the produce offerings. I will admit there are things here with which I am totally unfamiliar. 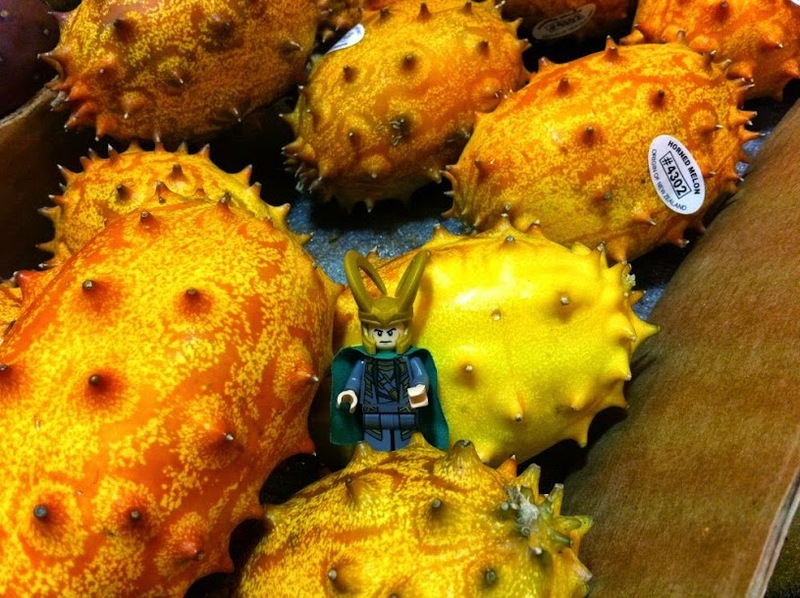 No, Sigyn, I don’t think these are real. I have seen eagles’ eggs, and they do NOT look like this. You would NOT get an eagle if you incubated one of these, but you might get jam. 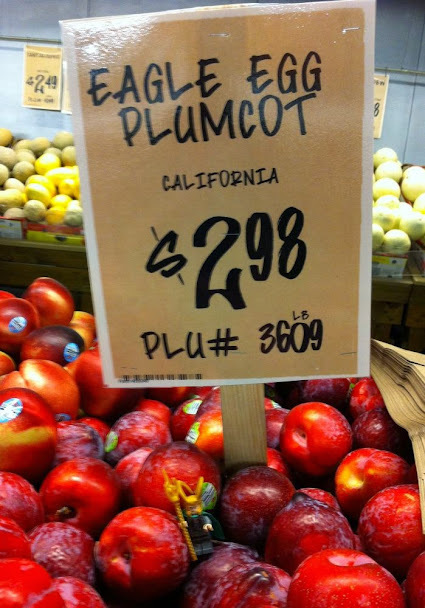 Some produce clerk is having a joke at the customers’ expense. I shall complain to the management. Likewise, these dragonfruit will hatch no dragons. But they are intriguing because they have pointy bits. The human female says that they can be either pink or white inside but that they do not taste like much. Pity. They are quite decorative. On the other hand, these tamarillos are supposed to have plenty of flavor. Sigyn says they are most photogenic. I concur. Whoa. Sigyn, what have you got over there? Bumpy and red–aren’t those funny? Oh, yes. I have heard of these. This is a plant that cannot make up its mind about its own name. 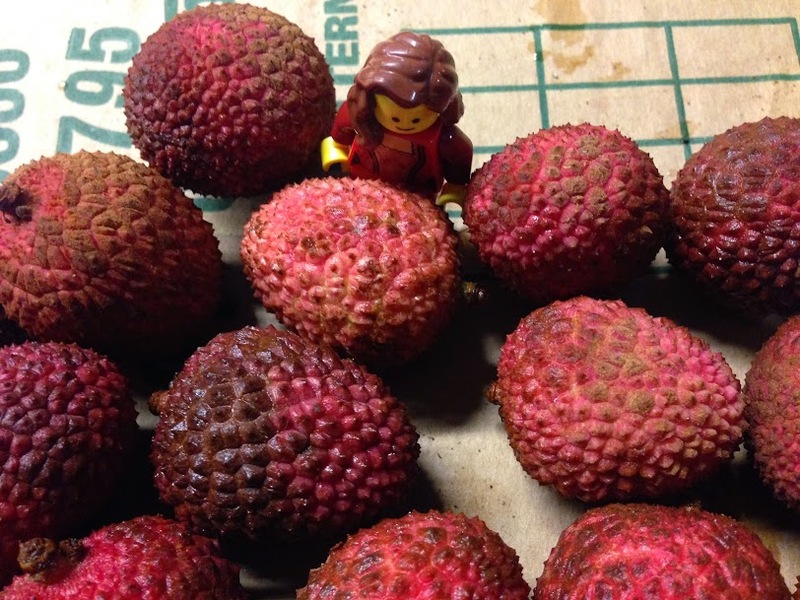 Litchi, Lychee, Leechee, Lichee, Lichi… They should just call them “eyeball fruit,” because that is what they look like if you remove the leathery peel. White, translucent, slimy, and with a dark, pupilly seed. Tasty, but I do not think I wish my fruit salad to stare back at me. These fruits are even weirder. 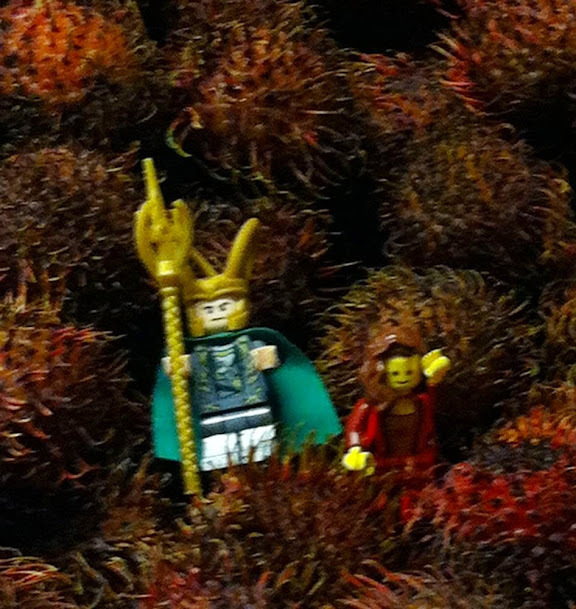 All hail Sigyn, Queen of the Furry Rambutans! Trust the human female to bungle the one photo I really wanted. I do not know what a Feijoa may be, but if nothing else, they are a good color. Aha! 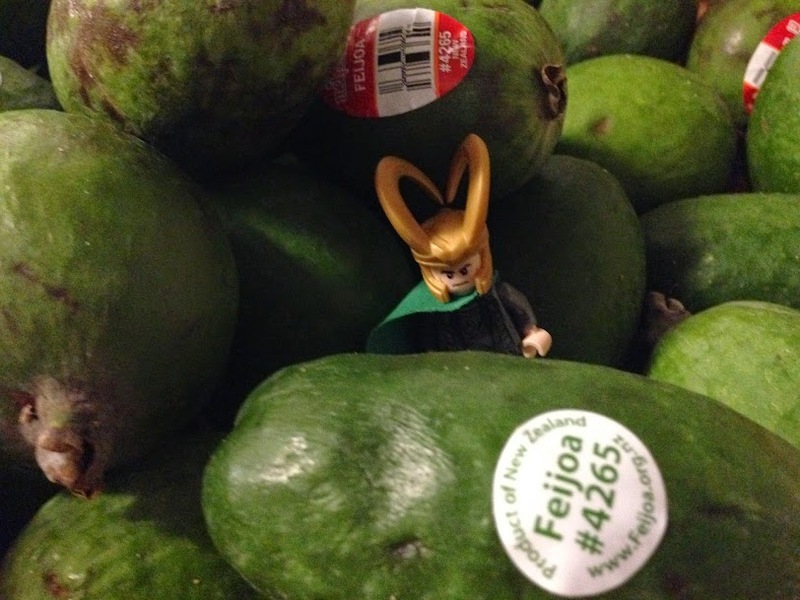 Forget feijoas, I have Found My Fruit!!! They are horned and spiky and hideously expensive and beautiful — and they are sneakily green on the inside. I shall command the human female to put down the quinces she is dithering over and buy some of these so that we may have glorious spiky fruit sauce! Beloved, I think we should be moving on. The produce manager has failed to stump the human female today — she recognizes everything displayed and is being insufferable about it. Let us go see if the food court is handing out samples. Now I know what the small ice chest we brought down in the car is for. The humans are visiting one of their large, fancy indoor food markets. The human female can hardly restrain herself. She and Sigyn are actually cooing at the various botanical offerings. Yes, yes, Sigyn. The “eeeetty beeetty” squashes are “cute,” but people are staring. No, I did not know that the ‘Easter Egg” radish variety came in so many colors. Should I care? Oh. The lights have just flickered. Was that thunder? It is supposed to be stormy outside today. Clever Sigyn has found an umbrella in the event of an indoor downpour. One of the humans’ favorite shops down here is one that sells various imported trinkets, comestibles, and collectibles/dustables from the British Isles. I may be a Jotun transplanted to Asgard, but for some reason I have a soft spot for all things British. Apparently Sigyn does too. Or maybe it’s just a soft spot for glass hedgehogs. Mmmm. 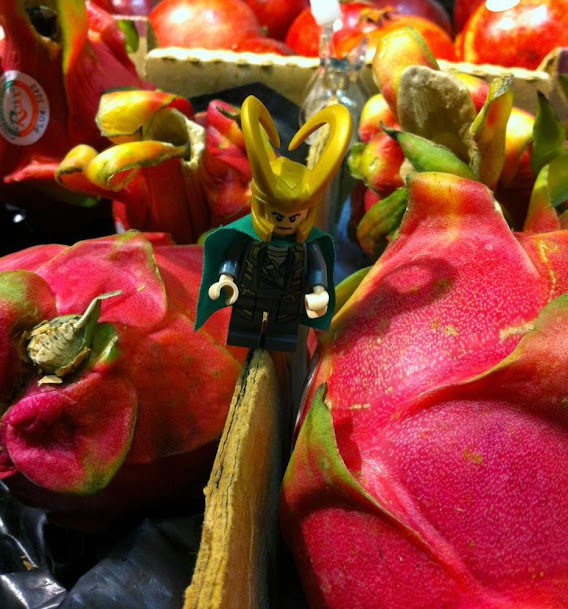 Sigyn, look–there is a whole shelf of delicious confections! You would probably love those Bakewell Tarts. Not only do they come in a bright red box, but they are full of raspberry jam and almond cream. How do I know this? 1) I can read, and 2) the human female is doing that drooling/reminiscing thing she does when she thinks of what she ate in England. And while you enjoy those Bakewells, I shall have a go at the apple tarts in the green box. They’re made with Bramleys, which the human female says are “a very old English apple best suited to baking and not for eating out of hand.” Apple nerd. We may never get the womenfolks out of here. The humans have a holiday from work today, so they have picked up a friend and driven to the nearest large city. But ehehehehe! I whispered in the merchants’ ears, and all the shops they wished to visit are closed! No fountain pens or quilt fabric for YOU! They are consoling themselves with dim sum. While we wait for friends (including the female’s Kinttery Friend) to meet us, Sigyn and I are exploring the windowsill forest. Ah, the friends have arrived and we are feasting on various nibbly dumplings, stuffed puffy dough balls, things cooked in leaves, and tarot balls with miraculous prognosticatory powers. I will make a prediction: the humans are going to be devastated when they learn that this restaurant is closing next month. Wherever will the human female get her Woo Gok fix now?